National Public Radio has taught me hundreds, no, thousands of useful things over the years, and, without a doubt, I've done what I could to support them for enriching my life. More recently however, lacking a real steady income, I've decided that my monthly contributions to MPR would be better spent on, say, rent or something. We all know how it goes. However, after today I may have to rethink my position, and start shelling out a little bit of cash. Today, while listening to the radio, I learned that Andre The Giant once allegedly drank 119 beers in 6 hours. That's a game changer. For perspective, that's 4.9 cases of beer, or one beer every three minutes, non-stop. In other terms, that's a 44.6 foot tall wizard staff. Using the google to find further information about this feat, I found that Modern Drunkard Magazine had named Andre "The Greatest Drunk On Earth", and they also have a recounting of the story mentioned above. Happy Weekend. 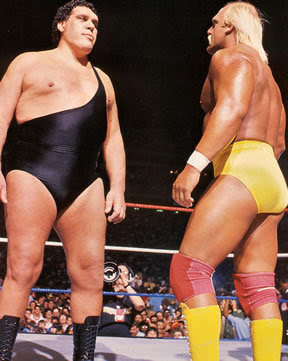 I suggest seeking out the A&E biography episode of Andre The Giant. did you hear that on wait wait dont tell me?